She sits across from me, a white-haired bird of a lady, a stranger. I glance at my iPhone. I can give her twenty minutes, if I skip my errands. I should have refused her offer of a cup of coffee, but I could not, especially under the circumstances. Now I sit on a green vinyl bench in a café booth, towering above her, my belly touching table, while she fumbles with a clunky, prior century cell phone. Twenty minutes is it. Then I have to get to the middle school to watch Jenna’s basketball game. Maybe she’ll get on the court this time. I glance at my cell phone again and take a sip of my coffee. “The hat,” I prompt, pointing to a dreadful robin’s blue, rainbow-speckled lump on the window sill. “You’ve had it for many years?” That I don’t doubt. The matted felt is worn and the colors are time-weary. I pick the hunk of plastic up. It’s about as simple as a phone could be, with huge numbers and a bright green call button. I dial the number, press call, and hand the telephone back. Tapping my fingernails nervously on the table, I notice that my thumbnail is split and focus on separating the two mica-like sheets. How did I get myself into this? It was that ugly hat. I had pulled into the Market Basket to pick up a few odds and ends, when the white sedan in front of me slammed on its brakes and the woman across from me stepped from the car. A flash of blue, caught by the wind, flew over its roof, tumbled across tall reeds, and into a ravine. The woman watched in disbelief. I made some inane comment about it sounding special and that there must be a story. I expected a nod and smile, and then I’d make my quick exit. But no, I was not so lucky. She touched my elbow and said, “Why, yes, there is a story. Let me buy you a cup of coffee and I’ll tell you all about it.” And now here I sit, one fingernail shred and shorter than the rest, drinking a cup of coffee that I definitely do not need, while she waits for Triple-A to arrive. Her call finished, the woman slides the phone toward me. “Did I hang it up?” I listen, press the red button, and ask once again about the hat. She reaches over and strokes the blue mass. Her cell phone rings. In a world where cell phones vibrate, buzz, and chime, the old-fashioned sound penetrates the surroundings, loud and demanding. She fumbles with the phone trying to answer, and finally finds the obscure, huge, green button. I use the interruption to check my cell phone. I’m out of time; it’s time to make my excuses and leave. I think of my little girl, with her hated brown curls and single-dimpled cheek. I reach into my coat pocket and sift past a Kleenex, hair clip, and chapstick, to touch a small, heart-shaped stone. When she was four, Jenna had picked it up from a pathway, and with childish delight, given to me. The coolness of the stone against my warm palm was comforting. “Thank you for the coffee,” I say, picking up for my coat. I set my coat back down and sigh loudly as she continues. 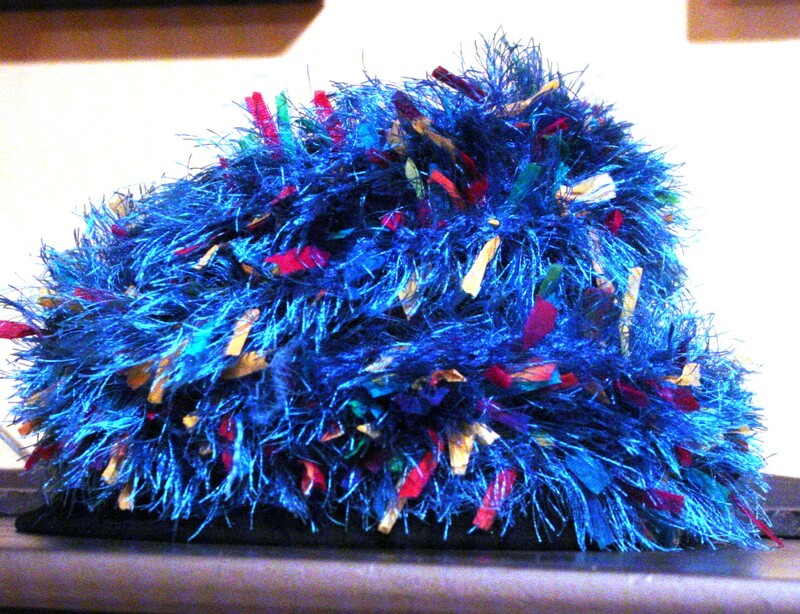 “Nestled in green and red tissue paper was this blue hat with specks of hot pink and yellow. I’m not sure I have ever seen anything quite so gaudy in my life.” The woman giggles. Really giggles! I smile back absentmindedly battling the compulsion to look at my phone. “Oh, I didn’t tell you, did I? She’s in the hospital having gallstones removed. I snuck out to get her flowers, and well, you know the rest.” Her hand flits in little circles in the air to punctuate her statement. Then she looks past the vivid blue hat, out the window, toward the stranded white car. Her cell phone rings, again alarming our senses. Our eyes meet and she nods her permission. I pick up the phone up and answer. “Hello…Mrs. Hendricks? This is Wentworth-Douglas Hospital.” I look at the serene woman; at Mrs. Hendricks. A shadow of a smile lingers as she pets the hat. I touch the cold stone in my pocket. This entry was posted in Fiction, Good Neighbors, Volunteer, Reading and Writing and tagged Cancer, Chemo, DPchallenge, fiction, Roadside Assistance, Triple A. Bookmark the permalink.